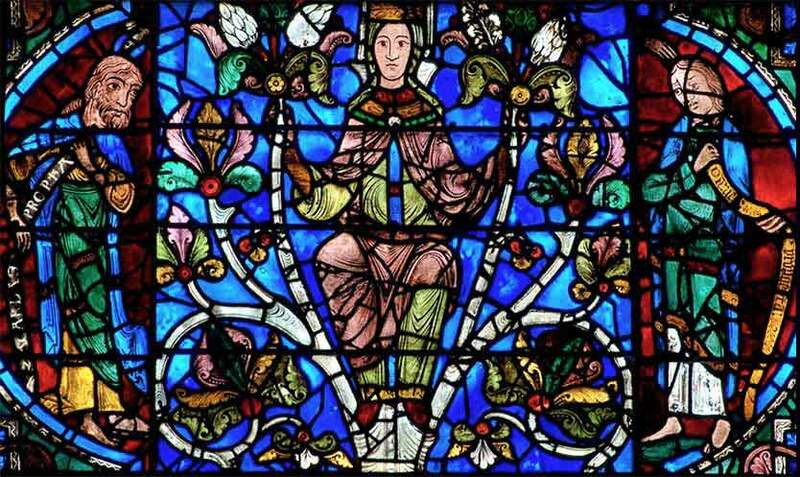 Tree of Jesse (detail), Chartres Cathedral, 12th Century, depicting Jesus (with the seven gifts of the spirit, as doves), flanked by the minor prophets Habukkak and Zephania. our full homage to command. After this Jesus went away to the other side of the Sea of Galilee, which is the Sea of Tiberias. And a large crowd was following him, because they saw the signs that he was doing on the sick. Jesus went up on the mountain, and there he sat down with his disciples. Now the Passover, the feast of the Jews, was at hand. Lifting up his eyes, then, and seeing that a large crowd was coming toward him, Jesus said to Philip, "Where are we to buy bread, so that these people may eat?" He said this to test him, for he himself knew what he would do. Philip answered him, "Two hundred denarii would not buy enough bread for each of them to get a little." One of his disciples, Andrew, Simon Peter's brother, said to him, "There is a boy here who has five barley loaves and two fish, but what are they for so many?" Jesus said, "Have the people sit down." Now there was much grass in the place. So the men sat down, about five thousand in number. Jesus then took the loaves, and when he had given thanks, he distributed them to those who were seated. So also the fish, as much as they wanted. And when they had eaten their fill, he told his disciples, "Gather up the leftover fragments, that nothing may be lost." So they gathered them up and filled twelve baskets with fragments from the five barley loaves left by those who had eaten. When the people saw the sign that he had done, they said, "This is indeed the Prophet who is to come into the world!" Uncharacterisic of John's Gospel, the feeding of the 5000 is also recorded in the synoptic Gospels; in fact, it appears in all four Gospels and is certainly one of the most famous stories from Jesus' life. (Note that this is apparently a different incident than the feeding of the 4,000, related in Mark 8:1-10.) The miracle is understated, because the 5,000 counted were all men. If women and children had been included, the number could easily have exceeded 10,000. In some respects this miracle is more typical of John than the Synoptics, because it seems to be allegorical. It occurs at the time of the Passover; it thus brings to mind God's freeing the Jews from slavery and feeding them with manna in the wilderness, where they were lost. The people of Israel were still lost when Christ came, but in a spiritual sense, for they had been unable to maintain the laws of Moses. Jesus gives them miraculous bread, but it is not just bread made from grain, which gives life to body, but allegorical "bread" that will give life to the soul. To strengthen the tie between Jesus and the early Jews, the disciples gather up 12 baskets of scraps. Although He has one purpose and one accomplishment, the salvation of humanity, still there is a special relationship between Jesus and the 12 tribes of Israel. It is as if he is showing a willingness to save the Jews twice -- either as the savior of the world, or as the Messiah prophesied throughout the Old Testament. More broadly, Jesus shows that His resources are unlimited. Andrew and James provide a foil for the miracle. They remind us that we should always have faith in God's power and love. When we are troubled or our lives seem filled with problems, that is the time to think of all that God has done for us in the past.